Sony will offer a free replacement for the affected SD cards. * Please note that this symptom may occur in products which will be released in the future. 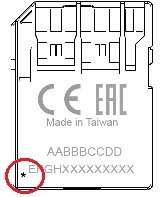 The SD card eligible for replacement does not have marking on the back as shown in the below image. Prior to replacement, please backup or move the contents in the affected SD card to your computer and/or other media.